Update: New cover artwork and updated blurb. Reach for the Sky, Carve Her Name With Pride, Sink the Bismarck!, Alfie, You Only Live Twice, The Spy Who Loved Me, Moonraker, Educating Rita, Shirley Valentine ... a remarkably varied collection of subjects and just some of the films directed by Lewis Gilbert during the course of seven decades in the industry. 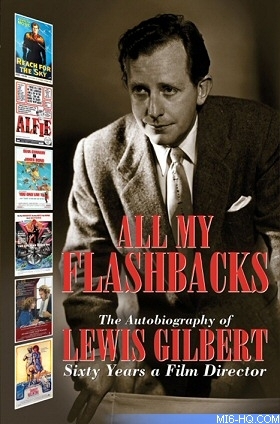 In All My Flashbacks Lewis Gilbert recalls his tragic childhood as a music hall entertainer, his traumatic wartime service in the RAF and ultimately one of the most distinguished careers in British cinema. Along the way he describes working with such diverse personalities as Laurence Olivier, Alfred Hitchcock, Michael Caine, Sean Connery, Roger Moore and Liza Minnelli. From modest post-war comedies to the most lavish James Bond epics ever made, Gilbert shares the secrets behind some legendary movies and reveals the sometimes uncomfortable truth about the stars he worked with. All My Flashbacks is the inside story of some of our best-loved films, but above all it is a warm, incisive and deeply moving account of an extraordinary life. Lewis Gilbert was born in 1920 and began his career as a director while attached to the US Army Air Corps in the Second World War. He went on to direct over 40 films, including three James Bond movies and such classics as Sink the Bismarck! and Shirley Valentine. Also a prolific writer and producer, Gilbert’s numerous awards include two BAFTAs (Reach for the Sky and Educating Rita) and a Golden Globe (Friends). His 1966 movie Alfie was nominated for numerous Academy Awards. In 1997 Gilbert was appointed a CBE for his achievements in film, and five years later directed his final picture, Before You Go. Wherever he lives in the world, he remains a loyal supporter of Arsenal Football Club. The book includes 40 illustrations.